Could Megaladon be real? 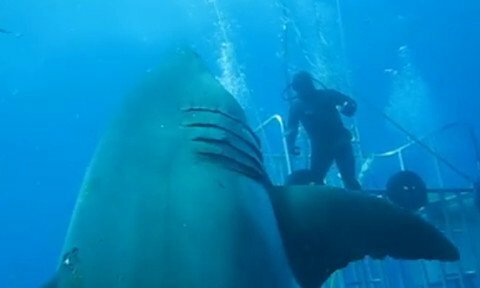 New footage released by a marine biologist in Mexico appears to show a 20-foot white shark that could just be the largest shark ever recorded on film. The video, captured by Mauricio Hoyos Padilla, who has been studying marine life off Guadalupe Island, Mexico, marks the second social media appearance for the massive shark dubbed “Deep Blue.” Padilla captured footage of the beast from a shark cage back in June. In the latest video, there is no mistaken the size of female shark that Padilla estimates at 50-years-old. Padilla says it’s very existence is a sign for hope that conservation efforts have been working. “Deep Blue has been spared from longlines and the inherent dangers of being in the wild, and somehow she has found her way in the vast ocean,” he wrote in a blog post. During November and December last year, Padilla reports seeing several pregnant females like Deep Blue around the island feeding on seals. But now there is a new challenge. With Deep Blue pregnant with several babies, she will have to swim close to shore in order to deliver them in shallow waters. Padilla is currently seeking assistance for his work PelagiosKakunja.